Before we tackle this subject, let's be sure that you have a firm grasp of pronouns, shall we? Pronouns are words that take the place of nouns. Did you already know that? Okay, here we go. or specific person or thing. The prefix in- comes from Latin, and it means not. Knowing that can help you remember that they do not refer to something definite. They still fit the definition of a pronoun, though. That means that they take the place of nouns. Antecedents are the words that pronouns refer to, and these pronouns do not usually have antecedents. Both of the girls ran through the park. Both does not have any word that it is referring back to. So, it has no antecedent. Someone gave me a gift. Someone is not referring to any other word in the sentence. This means that it has no antecedent. Here is an example of an indefinite pronoun used with an antecedent. Notice that the antecedent comes one sentence before the pronoun. The students cheered. Some even threw confetti. The pronoun some is referring to the noun students. This means that students is its antecedent. When these pronouns are used right before nouns, they are actually acting as adjectives, not pronouns. How do you like that?! 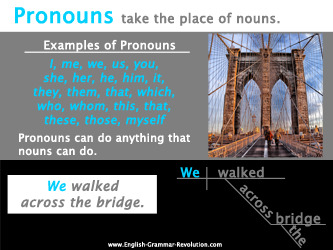 Remember that pronouns take the place of nouns and adjectives describe nouns. Both is telling us about the subject, flowers. It is not taking the place of flowers. It is modifying it. Because of this, it is acting as an adjective. Both of the flowers are lovely. And then, both would be acting as an indefinite pronoun. In this sentence, flowers is acting as the object of the preposition, and both is not modifying it. That means that the pronoun both is the subject, and it has no antecedent. Sentence diagramming is a way to show how the words in a sentence are related. Learning diagramming will help you to learn grammar, and you might be surprised to find out that it's kind of fun, too. I ordered your complete set of courses and books. I am extremely pleased with the thoroughness of the materials, and I really like your videos. Now you know all about indefinite pronouns!